The panel punches are designed to create panel cut outs for OMEGA's family of thermocouple connectors. Three styles of panel punches are available. 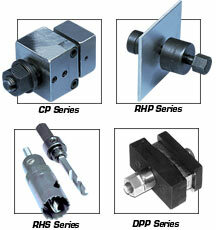 The CP series is for rectangular connectors, the RHS is for round connectors and the DPP are DIN sized panel punches. Use your hand drill or drill press to fabricate jack panels with hole saws and around hole connectors. When the plate is too thick for punches, the saw is the solution. Complete assembly including saw, pilot drill, and mandril.